Last night was the Open House for my school! I was super nervous although I had met a few families previously, but everything went very well! The morning of Open House I kind of panicked because I realized that I didn't have a whole lot of student work up... I mean, I have my Bravo board (thanks, The First Grade Parade!) and my little name mosaics outside, but I felt that it was a little devoid of other stuff. So in an attempt to clean out that black file cabinet you see in the corner, I found this OLD book about making cards with kids. The card designs were incredibly complicated and ridiculous, but I did find this pattern for a spiral card for Mother's Day, which I adapted to our mini science unit on hurricanes. After we studied hurricanes, talked about Hurricane Irene, watched a few hurricane informational and footage videos, and I ensured the kids a hundred times that we definitely will not have a hurricane, even though there are lakes nearby, the kids wrote facts about hurricanes on their spiral cards, backed them with construction paper, and cut them out. The kids loved them and they were SUPER excited to show their parents! Since they did it earlier in the day, they still remembered what they wrote... so I guess my procrastination paid off. ;) Here's a close-up. They turned out well! As part of our mini hurricane unit, we also acted out a hurricane.... because I don't know about other first grade classes, but my students NEED brain breaks like every 5 minutes! This was a good way to get them up and moving. And it reinforced the idea of the eye of the hurricane! And then here's just some other stuff that I wanted to show! First, my "about me" board featuring my new sign from Miss Kindergarten's Etsy shop!! My girls just LOVE it and they keep drawing peace signs on everything. I'll add some more stuff as the year goes on but I think this is pretty good to start. I don't think that I posted my jobs board yet. I got the sign from One Extra Degree and just printed it on bright paper. Then, I borrowed Mrs. Lemons's idea of using library pockets for my jobs and I just cut up cardstock and wrote their names. I haven't switched jobs yet, but I think I will on Monday. Some of the kids' jobs are kind of lame... I didn't realize that until after we started school. This is featured on the lovely side of my huge desk! And, lastly, I dipped my little toe into the Reader's Workshop idea today inspired by the awesome Debbie Miller. 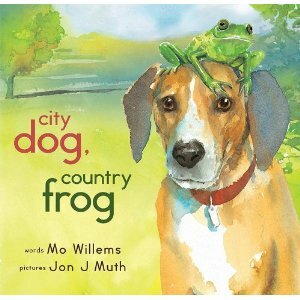 Have you read City Dog, Country Frog yet? It's by my bff (in my dreams), Mo Willems. If you haven't read it, let me summarize - a dog and a frog meet up once a season and they just do their thing, playing around outside. When winter comes, the dog can't find the frog, and when spring comes around, the frog is still "missing" ... but the dog finds a new friend. It's a pretty heavy book, and I wasn't sure if my students would understand, but I had one friend who called out, "The frog's dead, you guys" when we were towards the end. Hey Jill-don't stress about the math stations-it will all work out! My advice is to just jump in and get started and then work out any problems as they occur-which is pretty much what I'm doing-and trust me we are still encountering plenty of little problems each day! I actually do my math lesson and workbook pages during a half hour in the morning, and then we do our math stations during a half hour in the afternoon. I like having them at separate times. My goal is then to eventually be able to pull groups for additional instruction (reteaching, review, challenge, etc.) during the station time since my workbook will already have been taught. So maybe you could get the 2nd graders started on a very simple station (like rolling 2 dice and adding the numbers together and recording it) and then have the 1st graders come to your table to learn a math station and then switch. Once you have built up a few games the kids all know, you could more officially start math stations? I would not worry about having all the kids doing the same station for awhile or just doing really super easy stations until they have learned how to do stations. Your job must be so challenging having 1st and 2nd graders together-I have taught both of those grades and they are SO different. I would think a K/1 multiage would be a lot easier. Most of my first week stations were exploring manipulatives so there wasn't really much to teach the kids-we were more working on behavior during stations-but I think I remember you don't have a lot of manipulatives-but maybe you could borrow some from another teacher for a week just to get started? Very cool...did you see the hurricane lessons I posted? You might be done, but if you go to my blog and find hurricanes in the labels box, you'll see them!. I chose you as one of my top ten education blogs! Please head on over and grab your button at http://bit.ly/rtHPbL. Have a wonderful evening!